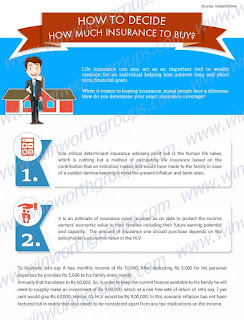 Home > Life Insurance > How to decide how much Insurance to buy ? Life Insurance can also act as an important tool in wealth creation for an individual helping him achieve long and short term financial goals. When it comes to buying insurance, many people face a dilemma: Am I buying too much of coverage, or is it enough? How do you determine your exact insurance coverage while ensuring you don't waste money on unneeded coverage – or worse, leave your family exposed? Everyone needs insurance. But unfortunately, most Indians are either uninsured or underinsured. More so, many still think that life insurance is just for financial protection in the event of untimely death of a family breadwinner though it should be the first step in financial planning journey. But have you, however, ever thought how much insurance is actually good enough for you? You may have several insurance policies but are you also adequately insured? It is important to know and understand insurance policies with respect to your finances before you commit to one. It is an estimate of insurance cover required as on date to protect the income earners' economic value to their families including their future earning potential and capacity. The amount of insurance one should purchase depends on the policyholder’s economic value or the HLV. To illustrate, let’s say AA has monthly income of Rs 10,000. After deducting Rs. 5,000 for his/her personal expenses he/she provides Rs. 5,000 to his/her family every month. Annually that translates to Rs. 60,000. So, in order to keep the current finance available to his family he will need to roughly make an investment of Rs. 9, 00,000, which at a risk free rate of return of, let's say, 7% would give Rs. 63,000. Hence, A’s HLV would be Rs 9,00,000. In this scenario inflation has not been factored but in reality that also needs to be considered apart from any tax implications on the income. Need analysis is also an important factor to consider while buying insurance. Typically a person would purchase insurance for protection, wealth accumulation, maintenance and retirement. Each need will have a different insurance requirement. Policies should be bought in accordance with the suitability of the need. Remember, having too little insurance could mean that your family is not being financially secure in case of untimely death. And having too much could mean that your money is being spent in paying premiums at the cost of other lifestyle spend.